Here's the completed Rhino chassis with all of the magnetized weapon options. From doors to turret, it's all their on this model. Doing this to your model will allow you to make one Rhino or Predator in any configuration which is a great feature when it comes to changing things up as your list changes. Hands down, this is the way to go with vehicles. 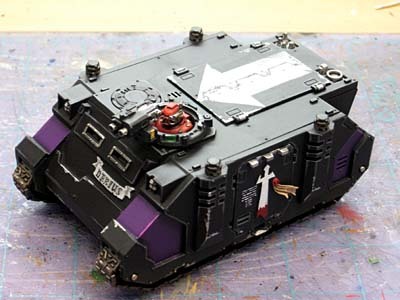 Now do a vindicator, whirlwind, and razorback, please. That is pretty awesome. I do intend to build my CF and SW razorbacks so the heavy bolters and lascannons are swappable, but I hadn't planned on anything so elaborate. Very cool. Talk about getting the most for your money... Holy crap, this takes the cake. One size truely does fit all. Nice work and presentation. Thanks, Ron. If you leave the top off of the Rhino, you can do the Whirlwhind/Razorback without any effort at all. A vindicator, though, would be a different matter. Nice! looks great, its very clean and well done. 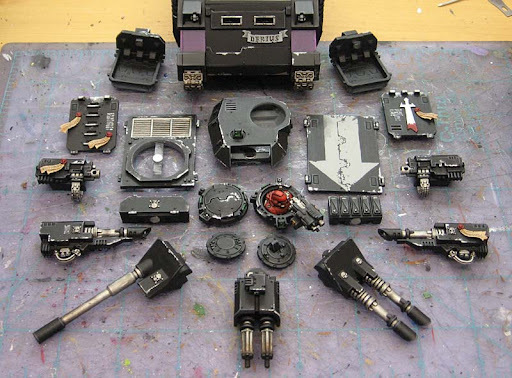 Ill be doing a vindicator/rhino magnetization pretty soon here.. any tips? Bodacious and Rushputin: You can use the same opening you use for the Predator to make a Razorback or Whirlwind, just turn it 180 degrees. You could "flip it" over for true accuracy but the opening is the same size all the way through and I would be inclined to keep all the mounts on one side for ease. 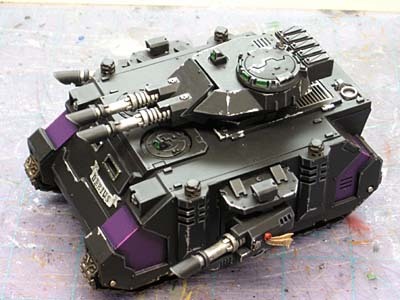 The only thing I'm missing are the actual weapons to make this into a Razorback or Whirlwind. If I had the weapons, it could be used as one of those too. A Vindicator might take a little bit of work, but it looks possible from glancing at the sprues. Anyone willing to send me the bits and pay for the magnets, I'll make one. I didn't realise how customisable this project was until I saw all the bits laid out. Excellent work mate. using the BA codex rules? looks awesome. 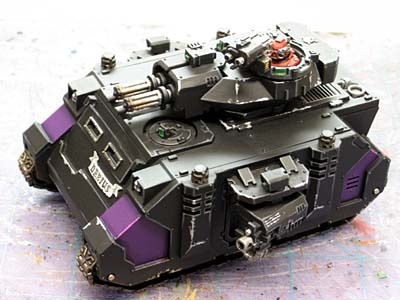 Using your baal turret with no sponsons could let you take the tin-linked assault cannon razorback at least fyi. Somewhatdamaged: It was an option my client requested. I'm not sure what Codex he'll use in the end, but he has the option now. Seriously awesome!!! Thank you for this I plan on doing this for alot of my vehicles! !